Music Jobs>Guitarists Wanted>Pro Acoustic Guitarist/Singer/Performer - Fun, Interactive, Human Jukebox! Hello! I'm looking to meet awesome, experienced, versatile upbeat acoustic guitarists/performers/singers with a HUGE love of music, great songs, harmonies and people. 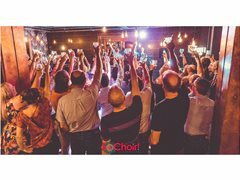 In 2016, I had an idea of starting a couple of super-fun, social choirs in cool bars in Leeds & Wakefield. I called it So Choir! (short for Social Choir). So Choir! is THE cool, fun, modern, turn-up-and-sing meetup for everyone and anyone. We don't care if people have never sung before or feel they can’t sing very well (or at all!). We don't do auditions, or sheet music, big commitment or stuffy rules and no-one ever has to sing on their own. In fact, forget everything that comes to mind when you think "choir", because So Choir! couldn’t be more different. We just turn up, meet up and sing! Word got around and we were soon asked to bring our So Choir! project into workplaces and offices across Yorkshire - which has also been really successful. We also started making videos of us covering pop/rock tracks which we posted on YouTube - some of which have had thousands of views and bought us lovely comments from across the globe. Not only this but last year, our videos started getting noticed by the original artists who's songs we'd covered including The Feeling & Dodgy - both of whom have invited and/or involved us in their UK tours. We're all about keeping music live, accessible and highly interactive. So Choir! is a band that anyone can join and we make stuff sound great! I'm looking for Leeds/Wakefield area based, exceptional can-play-anything, versatile, confident, singing acoustic guitarists with a love of harmonies, great songwriting, and having fun with audiences. You don't have to be able to read dots, but a great ear, harmony & chord knowledge, ability to learn arrangements and busking skills will all come in extremely useful. As well as having the skills listed above, you need to be warm, friendly, social, upbeat and positive, with a genuine mega wide-taste in music and a passion for great pop/rock songs. You need to be reliable, flexible, with a can-do attitude and your own transport. This is regular paid work, with plenty of scope for creativity and growth as we grow. Our sessions happen during the week - daytimes and evenings every week during term time (we have breaks roughly around school holidays). We don't usually do sessions on weekends, apart from the occasional gig or video shoot. If this all sounds like you, it'd be great to hear from you. Please include a little about yourself plus audio and/or video links.